When Rae (of Made by Rae, of course) asked me to test out her upcoming Showoff Bag pattern, it couldn't have come at a better time. My current purse is filled with goldfish cracker crumbs, a miscellany of treasures such as pinecones, rocks, and leaves that Phoebe has collected over the summer, and smells of old milk from waaaaay too many leaky sippy cups. And who really has time to go through all of that and give it a good washing? Not this momma! So when my bag reaches that stage - it's time to sew a new one. I'm lucky enough to live in the same town as Rae and when she walked in with her lovely chevron version to our monthly crafter's meetup, I knew I had to make one for myself. The pattern is super easy to follow, and anyone with a basic knowledge of sewing could put this baby together in about an hour or two. It calls for a heavier home dec weight for the main print of the fabric, but this lightweight cotton print by Michael Miller (Ellie in Amber) was calling my name, so I backed it with a mid-weight interfacing which provided just enough stability to give this bag some shape. The top panels and straps are made out of a heavy upholstery-weight pillow sham that I got for $1.97 when Linens & Things was going out of business. Score! The only bummer is that the sham was shorter than the length the straps called for, so I ended up having to piece them, which kind of annoys me when I look at the photos. I should have pieced them on the diagonal, but I get a bit lazy regarding things like that. The best part - nice and roomy - my number one quality in a purse. Especially when everything you carry around is 95% for your toddler and 5% for you. The other best part? Rae has so kindly offered up a free copy of the Showoff Bag pattern to one lucky EmmmyLizzzy reader! She'll be releasing it later this week and you can be one of the first to get it! Just leave a comment, any comment, and I'll choose a winner on Friday. What a cute bag! I love Rae's patterns, and you've done this one justice, I love how happy and cheerful it is! Great use of the heavier and different textured pillow sham fabric for the top part and handles of the bag, I love the contrast! I would not have noticed the piecing in the handle if you hadn't mentioned it! I really like your fabric choices.. it looks pretty! And I would probably do the same thing you did with the interfacing; decor weight fabric often isn't in my taste, so using interfacing is brilliant. I LOVE the prints you chose! Those are just my colors :) Super easy is my type of projects. I completely agree with the 95% toddler and 5% you and I certainly need an open bag in order to accommodate! Oh I didn't notice the piecing until you said something. I was admiring the herringbone and wondering where you got it (clever lady!). I think that the fabric combo is great. It looks fun yet sophisticated. Great pattern & I really love the fabrics you've chosen. How generous of you and Rae. I'd love to win this pattern--then I can give it to my niece and ask her (nicely) to make a bag for me! I like the style of the Showoff bag; so big and roomy. Love the colours you've made the bag in. I'm so glad to hear I'm not the only person with a stash of bags, all of which would be perfectly serviceable if i just gave them a quick clean. The problem is by the time it's got into that state I've fallen in love with some other fabric so need to make another one! Love your fabric choices. I've wondered if it's "okay" to use two different weight fabrics in the same project like this -- so now I'm going to "allow" myself to do so. I love the fabrics you used!! Lovely bag! I am so loving this bag :) The shape and size are great, and totally my style! I wouldn't have noticed the pieced straps if you hadn't mentioned them either. Love your bag! And agree about making a new bag vs washing an old one. I have the perfect piece of fabric to show off, too. Your choices of fabric are awesome and I love the pattern! I love the bag, also glad to have found your blog! thanks! i love your fabric choices! it looks like a great bag. The bag is great, gorgeous fabrics! I like the fabric choices. Herringbone is one of my favorites. Enter me please! Thanks! The bag and fabrics are just lovely. Wow! I'd love to win this pattern! I've sewn with Rae's patterns before, and they're great! 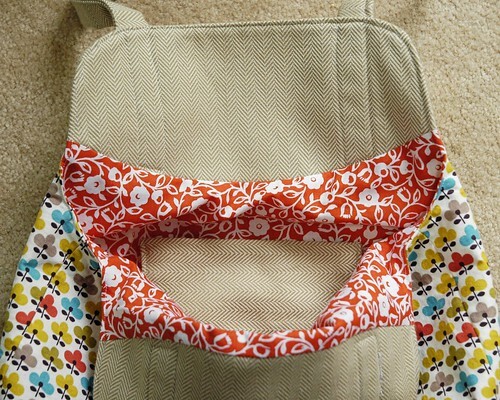 I've been eyeing this bag on Rae's website, and dreaming of combinations I can make. What a cute bag I would love to make one! It was love at first sight when I saw this bag. I can totally relate to purse contents being 95% for them and 5% for you!!! This is a great giveaway. Thanks! And the bag, I love the fabrics you chose. Ah and I didn´t notices the pieced straps until I red about it! Love this bag! Can't wait for the pattern! Love this bag, would loove to win the patten. Rae rocks. -Heathermdtx (at) gmail dot com. I love the herringbone! Too often I go straight to the solids as accent fabrics, but this adds some interest. I love this bag!! I'm planning on making a bunch of these this Christmas! love the shape of this, and the size looks perfect! great fabrics too. can't wait for the pattern! 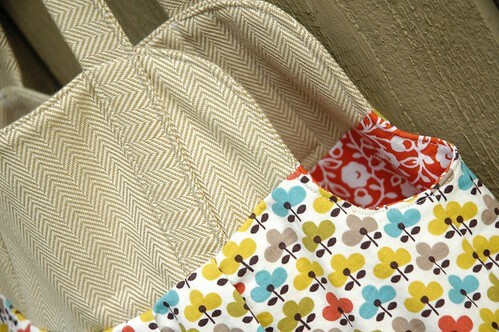 What a nice pattern, how wonderful to be able to show off up to 4 lovely fabrics. Just in time for fall and all the colors that come along with the season! The bag you made is beautiful. Thanks for giving a pattern away! This is SUCH a cute bag ... I would love to have the pattern! Great job. I like that you can use regular cotton and just add some interfacing. Thanks for sharing. I guess I could use a new bag too. Papers, wrappers and Ikea pencils galore. Thanks for the op. to win! AMAZING BAG! Love it, can't wait for a pattern! I love Rae'a patterns and love this bag! I love, love, LOVE this bag! I'd really like to win!!!! Great bag with beautiful prints. We are our own worst critic. Your bag is awesome. I love the fabric choices (and that you didn't limit yourself bc it wasn't the "right" weight.). Great fabric combination--love the idea of using the pillow sham. Can't wait to see the pattern! Your bag turned out so cute! I love bags so I would love to win Rae's pattern! hooray for an adorable bag! would love the pattern! I really like the size of this bag. It's really cute. Cute bag! So true about what you carry around is 95% for your toddler and 5% for you. LOVE this bag!! And love the cheery fabric you used! My only bag just broke, and I so need to make a new one. This one would be perfect! Lovely job!! What a gorgeous bag! I love your color combination. Thanks for a chance to win! Very lovely and I like how you put your creative tweak on it so you could use fabrics you love. I wouldn't have thought to do that. I am starting to make Christmas presents for my family and think this bag would be much appreciated by my sister in laws! Or maybe I'd keep it for myself... I too need one big enough for my baby and toddler items and wallet! I have some gorgeous AMH home dec just waiting to be used for a bag. This one would be perfect! I'd love to win a copy of Rae's pattern! Oooo count me in! I love your version and the fabrics you've chosen. Great looking bag! I hope to try out the pattern soon. Love. LOVE. I love your version and I love her chevron version. Can't wait for the pattern to come out. So cute -- love Rae's pattern (what a great shape!) and your interpretation of it. wow an hour or two really? This is so pretty. i love the chevron fabric. I'd love to win the pattern. The bag looks gorgeous! i just discovered your blog, it's lovely! Very cute, I love her patterns. Your fabric choices are impeccable, love them. I love your fabric choices! Great bag. Adorable Show Off bag! Great fabric choices. Thanks for the chance to win the pattern. WANT want want it! Need it! Would LOVE to win it (but you know I'll just go buy one if I don't win). Thanks for the give away! Such a cute bag! I could really use a pattern like this to make a few for myself and friends. I'm overdue for a new bag. This bag is gorgeous!! And roomy too, as anyone with kids needs! the bag is adorable! i would love to win the pattern! 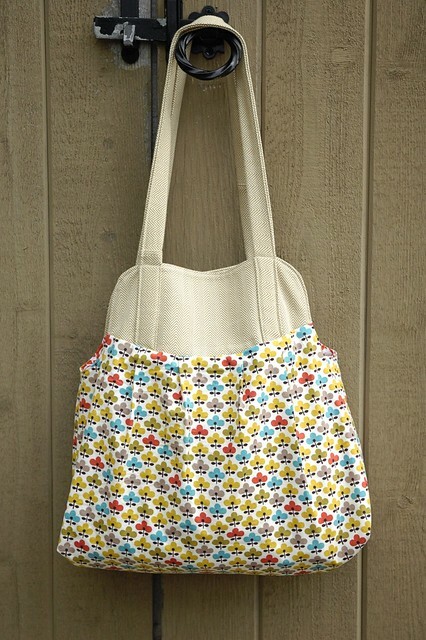 :-) I've been salivating over the bags Rae made on her blog and I would just die if I won the pattern. I would love to have a bash at making on for myself. Thank you for the generous giveaway. I love your version of the bag. Totally makes me want to make one...so that free pattern would really come in handy! I love the design, very cute! Ooh...I LOVE it!!! I'd love the pattern!! My little girl collects rocks and 'train tickets' roominess is definatly important. Your choice of colours are beautiful. So cheerful. I would love this pattern. I love your review, by your standards I was ready for a new bag a while ago, and a new car. I am still using the bag that enfamil gave me in the hospital, I need a style upgrade. What a cute bag, I would love a pattern. What an adorable bag! I love the Rae's chevron one, too. Great bag! I love totes! Such an awesome bag! I love it!! I'd love to try this pattern! I LOVE the colors and patterns that you used, especially that small chevron print on top. Love it! Your bag is fabulous! I would love to make this for my mom for Christmas. not sure if I commented on this or not...I don't see it if I did, but I could be crazy. Either way, LOVE the bag! I love the shape of this bag! Your version is great, very cute fabric choice! Beautiful bag! I headed over here after reading Made by Rae's blog for the first time! Super cute, love the idea of re-purposing a pillow sham. 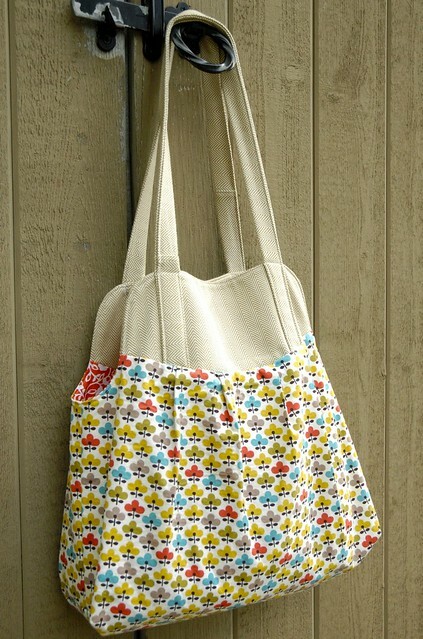 I would love to sew up one of these bags! My toddler has just about taken over my bag and I'm in need of a new, bigger one to replace the diaper bag. This is a nice bag pattern; thanks for the giveaway opportunity! Love the sham upcycling! Great bag, so many possibilities! i would love to make my own version!! Love the bag! So cute and such a perfect size and shape. Love!! Love the bag and your choice of fabrics. Wouldn't this bag be perfect made with a heavy wool and embellished with all those wonderful flowers crafters are creating? I have a few of Rae's patterns which of course I love. I would like to have this one too!! I usually don't follow patterns when I make a bag but I fell in love with this one right away. I hope I get to try it someday. Cute fabrics! I am in between purses and need to sew something up. Love, love, love it. I have been dreaming of making myself a new bag for a while now and I think that this in the one! Oooh, thanks for the chance to win! I love the fabric choices for the bag you made. What a beautiful bag! I love it when bags you can make yourself look like you just bought them in a store :-). This would be a bag I'd love to make! Thanks for the give away! Love this bag! Your fabric choices are yummy! Oh, nice bag. Cute blog, as well - my first time coming here. I'd love to give another one of Rae's patterns a whirl. I've made about 7 B3P's and the pattern is awesome! pretty! I'd love to win! LOVE this bag! Would love to win! Thanks for the chance! I would LOVE this pattern. Thanks! If I don't win this giveaway, I'll probably buy the pattern! So cute! That's such a cute bag! The great thing about it is that you could make so many different looks, just by changing the fabric! I love it. This is a lovely bag!! I'd love to give it a try. It was good to see you and all the ladies at the MQG last night. I'm dying to try my hand at a bag. I wear a lot of black for work, & have great ideas of how to make this work appropriate, but stylish! love it! looks deep and big enough for carrying all the kids stuff! I've never made a bag, but think now might be a good time to start. Looks great. Thanks for the giveaway. Oh I need an easy bag pattern.... been working on a purse for weeks now because it has so many confusing pieces. This one is so cute! Oh wow! That is so awesome!! It's a darling bag, and the roominess appeals to this grandmother, who also occasionally find she needs to carry around extra wet-wipes, tissues, snacks, and of course a camera! Thanks for this giveaway. I would love a purse pattern! Super cute bag! Love the contrast -- thought the straps and top was a suit in a former life! Thanks for hosting a terrific give-a-way!! That is such a cute bag!!! What a cute bag! I will keep my fingers crossed!! Super cute! I have 3 small kids so I think I may have even surpassed the 95% level! I just found your blog and I look forward to going through you older posts too. Love it!! That bag is great! And I'm jealous of the deal you got af Linens n Things! Love love love your fabric choices for this great bag. I've been watching Rae show it off... can't wait to try it out!!! Wow, that is really cute. Love your fabric choices and it's a bag that has real personality. Thanks for the give away chance. To be honest, if I don't win, I know I'll end up buying the pattern anyway. Too cute. Yay for new bags! I love this! Great bag, Rae's patterns are great. I think I have just the right fabric to make it. I would love to make one of these...I love making bags/pouches because it get quicker to the completion, which to a new sewer is good because it's beginning to increase my sewing confidence! I love that bag! 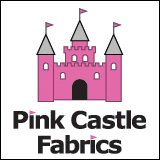 The fabrics you chose are great! 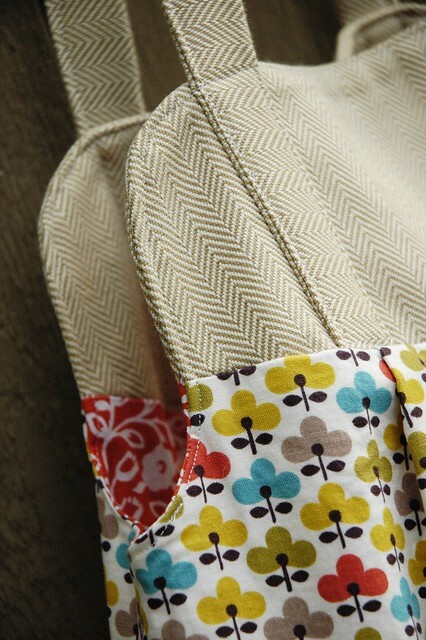 Love your choice of fabrics, and Rae's bags are just perfect..would love to make this one too! Ack! Want want want! Nice fabric choice! Lovely bag! And what a great idea to use interfacing to add weight to your fabric! I love the fabrics you chose... this bag looks great. I've got a couple of Rae's patterns already and love them, so can't wait to get this one. Thanks for the giveaway! Great bag - and I love your fabric picks! CUTE! I'm always looking for great purse patterns. I made the "Buttercup Bag" by Made by Rae and really like how it went together! I'd love to get this pattern. Winner, winner - and shop news!